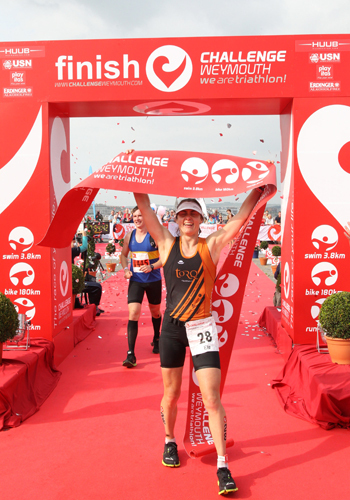 Nearly a week on and I almost still can’t believe I’ve just won “Challenge Weymouth”, at my second attempt over the Iron Distance Triathlon. After racing the first one in Lanzarote earlier this year, I was keen to race on home soil, so I could have the support of both my parents and friends. This time last year, I raced in London at the ITU World Champs. Having my parents there gave me such energy and I hoped I wouldn’t let them down this time. 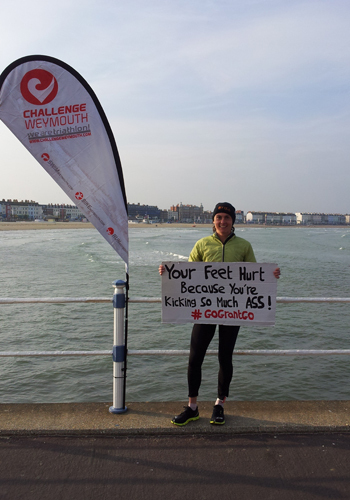 A rolling bike course and a flat seafront run, looked like the perfect combination for me. Having raced a few Middle Distance Races through the Summer, most of my recent training had involved some speedwork, and less of the long miles. A couple of weeks out from the race, the legs were feeling fast and I felt a good race waiting to burst out! However, I was still nervous about justifying my place on the Pro List, as the ladies’ field was the strongest Long Distance Race in the UK this year. The Pro List also included quite an international contingent from across the globe, all with great race CVs. I made it my focus to turn out my best race, improve on some learning points from Lanzarote and, if I could achieve that, I’d be happy with wherever I finished. When the announcement came that the swim was to be shortened, I was initially disappointed. 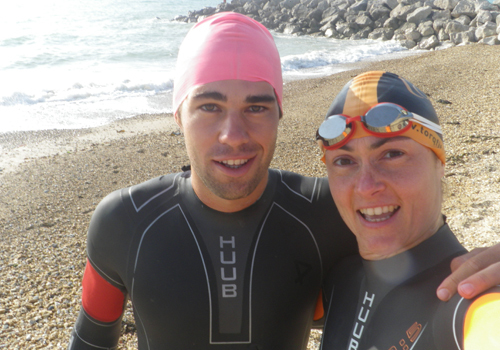 Although I have previously struggled in choppy conditions, my swim had recently been feeling strong, and a recce swim on the Friday with fellow UK pro Joe Skipper had boosted my confidence about swimming in the swell. After the gun went, it seemed to take several minutes before it became appropriate to quit wading in waist deep water (that didn’t seem to be getting much deeper) and commit to ducking and diving under the breaking waves. At least the conditions seemed to have the effect of breaking up the group and, whilst I had no feet to draft, at least I wasn’t getting bashed on the head like in the Lanzarote “bunfight.” This year, I have worked hard on upping my stroke rate and using less kick to replicate how I swim in a wetsuit, and with the choppy conditions, this technique was finally paying off. On the return leg, I think most people “enjoyed” varying amounts of sideways drift and after lap one, I popped out further along the beach than I’d intended. However, getting a second lap meant there was an opportunity to improve upon this on the second run in. 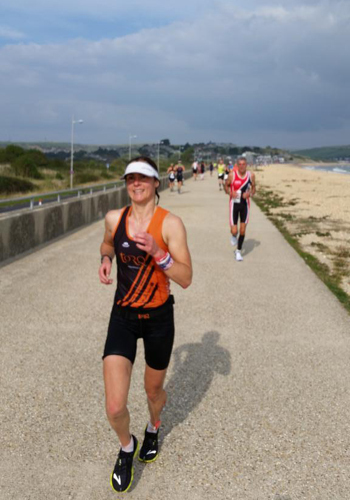 Coming into T1, I gathered I was 2nd Female, and about 2 minutes down on the leader. This seemed like a solid start to the day! Despite the waves, I had managed not to drink half of Weymouth Bay, and my stomach felt pretty good. Once out on the bike & after the first climb, I settled into my pace and TORQ nutrition. I’ve been training with power, but don’t use it for racing, as I consider I am pretty dialed into my race pace feel and heart rate. Many a time I have heard it said, that you should stick to your race plan until the last 10km of the run, and then start racing others should you have anything left in the tank. If this was an adequate strategy for Lucy Gossage to win in Lanzarote, it seemed madness that any of us mere mortals should attempt racing others much earlier in the day. So, with the twists and turns, and rolling terrain, I kept a check on my effort and was determined to control my own race. The course had an out-and-back section midway round each lap, this provided a great opportunity to see where the competition was. Michi was still about 2 minutes in the lead, but I could see Caroline Livesey, Jo Carritt and Tamsyn Hayes were only a minute or so back from me. It wasn’t long before Caroline motored by and there was no way I was going with her. However, on the way back into town, I could suddenly see both Caroline and Michi up ahead. I was really surprised as I had been feeling a bit rubbish for 10km or so. I hammered the descent and snuck past Michi, as she temporarily took a wrong turn at the roundabout for the second lap. At the top of the climb, I came past Caroline again, and my legs felt strong. I hammered the next descent, hoping to shake her off, but she trains in Yorkshire too and I should have realized she wouldn’t let me get away. Over the next hour or so, we alternated positions several times, so it took me a while to realize that in actuality, one of my turns on taking the lead, had actually turned into the makings of a break. I came into T2 with a lead of 3 minutes and headed out on the run. Again, I was determined to hold my own pace. This seemed like a slightly different proposition, given I had not ever dreamed of being in the lead, but it didn’t seem like the time to panic. Time to be patient, hold my nerve and stick to my guns. The course suited me perfectly. I am used to being run down, as historically this discipline is my weakness. I once held a 40s gap over a Standard Distance Tri, to take a win, and I had to trust my experience would serve me! The multi-lap course had several doglegs, with chances to see the competition and for family and friends to give me time checks. Initially, the gap was shrinking, and I tried to exude a calm demeanour when passing Caroline, Jo and Michi at the top end of the course. I was convinced they looked more comfortable, faster, with higher knee lift, faster cadence etc etc. Well, I must just stick to my heart rate and keep getting the Rhubarb & Custard gels, and what will be will be. 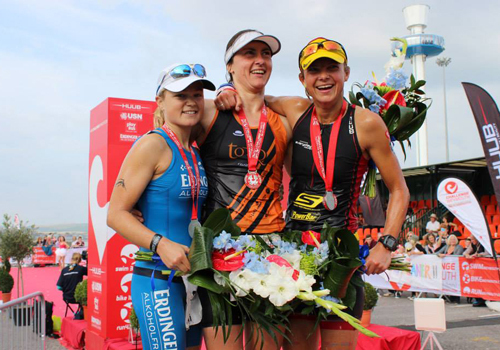 By the third lap, Caroline had started to fade, and Michi wasn’t gaining, but Jo was definitely now only 2 minutes back. I still convinced myself that sticking to my plan on lap 3 was my only sensible option, but the caffeine was now taking hold, and the pain in my feet and legs wasn’t getting any worse. I also passed this fantastic sign, which gave me such a lift & reminded me that I had done flippin well to last this long in the lead.despite it not being over yet. My form felt good (aside from my customary pigeon toe! ), hips and core were still holding together and shoulders felt relaxed, still smiling. I chugged on and dared to let the heart rate rise by a few beats, but still keeping it within the ceiling limit I was working to. 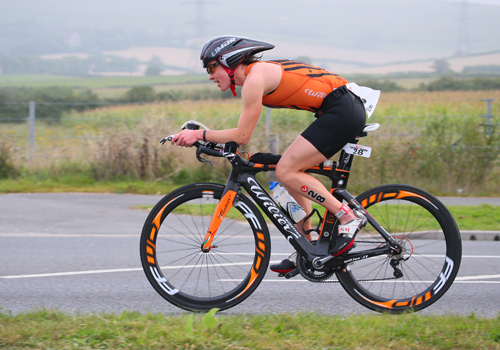 Onto the final lap, my Dad roared at me that my gap was now 4 minutes – I couldn’t believe it! My coach has always said, it’s not about being the fastest runner, it’s about slowing down the least. And I was doing it! Thoughts of winning started to creep in and it was all I could do to banish them and stay focused on the process. One foot in front of the other. At the final turn, I passed Jo coming the other way, she graciously high fived me. I was sure by now I “had it in the bag” and I was also pretty sure that her incredibly sporting gesture was not some trickery to get me to drop my guard. Nonetheless, it’s not over till you cross the line, and I couldn’t relax until I had rounded the Sealife tower for the final time and could enjoy the moment coming into the finish area. I was utterly overwhelmed, torn between grinning from ear to ear, and breaking into sobs of happiness – the finish line video is rather comical, with my family and friends. The highlight of the day was sharing a big hug with my parents, who had been subjected to nearly 9 hours of suspense and nail-biting. I just couldn’t believe it. I would have honestly been delighted to have finished in whatever place my race performance had achieved. My target was to be in the mix and to achieve that, I knew I needed to deliver a solid swim and bike, followed by a flawless run. If that flawless run delivered me a sub 3h30 marathon, I would have gone home happy. OK, I know the run course this year was short (and I am advised that it’s something the race organizers will address for next year), but I think my run time equates to a sub 3h15. In my heart, I believed that one day I would be capable of a 3h20 run, so to completely smash this, has exceeded all possible expectations. I was so nervous after the press conference, because I wasn’t sure if I had really deserved to be there amongst such experienced athletes. But after my second ever marathon with fastest female run split, taking the overall win means I finally can believe in myself, as many others have been telling me for quite some time.